In 1950, after over fifty years of military occupation and colonial rule, the Nationalist Party of Puerto Rico staged an unsuccessful armed insurrection against the United States. Violence swept through the island: assassins were sent to kill President Harry Truman, gunfights roared in eight towns, police stations and post offices were burned down. In order to suppress this uprising, the U.S. Army deployed thousands of troops and bombarded two towns, marking the first time in history that the U.S. government bombed its own citizens. Nelson A. Denis tells this powerful story through the controversial life of Pedro Albizu Campos, who served as the president of the Nationalist Party. A lawyer, chemical engineer, and the first Puerto Rican to graduate from Harvard Law School, Albizu Campos was imprisoned for twenty-five years and died under mysterious circumstances. By tracing his life and death, Denis shows how the journey of Albizu Campos is part of a larger story of Puerto Rico and U.S. colonialism. Through oral histories, personal interviews, eyewitness accounts, congressional testimony, and recently declassified FBI files, War Against All Puerto Ricans tells the story of a forgotten revolution and its context in Puerto Rico's history, from the U.S. invasion in 1898 to the modern-day struggle for self-determination. 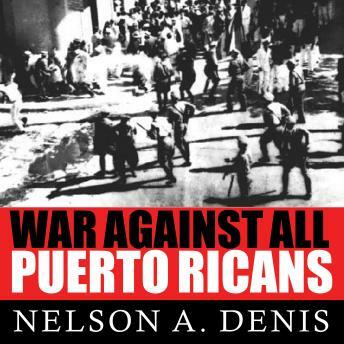 Denis provides an unflinching account of the gunfights, prison riots, political intrigue, FBI and CIA covert activity, and mass hysteria that accompanied this tumultuous period in Puerto Rican history.